It is hard to believe that it has been a quarter of a century since the Berlin wall and all the other parts of the German-German border came down. I remember it well. I had just gotten to the U.S.A. a few months earlier when one night my host Phyllis called me into her condo living room. I could not believe what I saw: right before my eyes the wall was coming down on evening TV on the news. Wow! I would have never imagined that this would ever happen. I was born in the late 60s and I had not known a unified Germany at all. The separation of both “countries” was all encompassing and outright intense. Although westerners could travel into East Germany, no East German could visit their family and friends in the West. My hometown of Hameln Germany was all but 2 hours away from the East German border. Close enough, but far, far away in another sense. People thought of reunification less and less. I remember going to the Harz mountains for skiing and sledding. That was very close to the border. We could get right up to the fence (the wall existed only in Berlin). The moment we would get within a few hundred feet we could see the guards getting busy checking us out with their binoculars. Patrols on foot and cars would wander up and down the fence on pathways sandwiched between the fence and the “death zone” on the East German side. The closer one got, the more activity went on at the other side. The “death zone” was approximately 200 feet wide. We called it that because it is estimated that more than 800 people were killed along 870 miles of the German-German border. 138 people lost their lives at the Berlin wall. It started with car and truck barriers that looked not unlike the steel cross barred tank barriers in the beach scene of “Saving Private Ryan”. They were not as tall though. Some areas used concrete barriers that looked like the spikes on the wheels of a landfill trash compactor. Then the next strip of land consisted of bare land that had been smoothed over with harrows. We had been told that this strip was covered with mines, trip wires, and automated shooting apparatuses. Rows of barbed wire were further installed trying to prevent anyone making it to the actual fence separating the East from the freedom of the West. From 1973 on out there was a “shoot to kill” order for border patrol soldiers. I still cannot believe Germans did this to keep Germans from reuniting. I am still having a hard time that this had happened after the horrors of WWII were over. 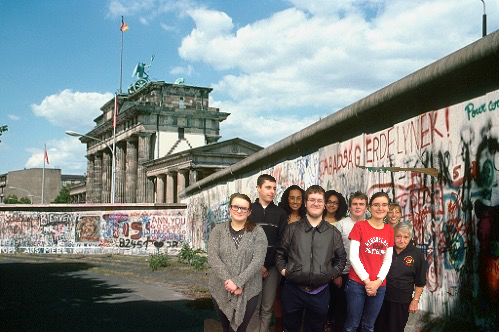 In 1982 I went to Berlin with our high school class. What a trip that was. We went there by train. Right before entering the border the engine had to be uncoupled just for letting an East German engine take over. East German border patrol guards with grim faces checked out our passports. When we crossed the border we could see the “death zone” up close and personal. There were no stops between the initial border crossing and entering Berlin. Standing in front of the wall was surreal. We could get close to it and touch it (that is why there was so much graffiti on it). Only East Germans could not get close to it at all.Western Berlin was nothing but a little island of the West right in the middle of East Germany.It must have been quite a thorn in the East German and Russian leadership’s minds. No wonder that in 1948 they tried blockading the city. With help from America this had been unsuccessful fortunately. The American sector had Check Point Charlie where westerners could cross over to East Berlin. There was a forced exchange rate of 25 German Marks West (roughly 15 Dollars). The East German Mark was not worth a 1 to 1 currency exchange but the East German state did not care much about this. You could think that this is not much money considering that while being over there you need to buy food and drinks. Except there was not an awful lot to buy to start with. Furthermore, anything addressing basic needs was not expensive at all. I found out about these little details when we took a day trip over to East Berlin. Any other goods were expensive, but cheaply made and typically not of great quality. You could not choose from a lot of a variety of products anyway. 7 year planning by the communistic leaders had to anticipate future needs of their people and production rarely matched the actual needs. Try planning for only ONE year ahead for yourself – good luck with that. Really humbling was the having fellow Germans beg me for West German currency. They did so in utter secrecy. This was forbidden activity and possessing any Western currency was forbidden. The few folks I spoke with were so afraid that they would be discovered that they would nervously look to the sides and behind them all the time. Horrible. Just horrible stuff. Germans would unify into a single country with freedom and prosperity for everybody. Little did I know it would happen not even a decade later. I am so glad we can celebrate the Fall of the Wall today. The German statesmen from back then did Europe and Germany a great favor by moving the reunification forward fast. In fact it was so fast that it happened within less than a year. When has government ever been this efficient and fast with anything? Though some disparity between income and unemployment still exists to this day, we still now enjoy a single Germany. Let’s never forget the unfortunate souls lost trying to cross the border that no longer exists today. Happy Fall of the Wall day! Thanks for the first person perspective, Ralf. I also remember it coming down. I remember that for the next several months the newspapers here in the US were full of articles claiming it was the beginning of universal peace, and some even claimed it was “the end of history”. I knew young men who had served in Germany in the US army during the ’50s and ’60s. It was a great thing over here, too, but obviously not as big as it was for you. Thank you for your comment, Tom. Have a great week.